The Libor system, which sets inter-bank lending rates, is "structurally flawed", the chairman of the US central bank has said. Ben Bernanke also told a Senate committee that it was not yet known whether any US banks were involved in the rigging of Libor. He said he still did not have full confidence in the system. That is because proposals made in 2008 to improve it were not adopted by the UK body which compiles it, he said. The New York Reserve Bank, which regulates some major US banks, sent recommendations to the British Bankers' Association in 2008 and raised its concerns with the Bank of England. This included the introduction of procedures to "eliminate the incentive to misreport" Libor, the daily rate that is the benchmark for millions of financial transactions which is calculated from the submissions by a group of banks. The Libor scandal erupted last month when Barclays was fined a record amount for trying to rig the Libor rate by mis-reporting the amount it cost them to borrow, sometimes working with other banks. Asked about US regulators' response to the manipulation of Libor rates, and whether anyone had "dropped the ball", Mr Bernanke said the Federal Reserve Bank of New York had taken the lead. When told by a Barclays trader that he thought the bank was undereporting its borrowing costs the New York Fed had responded "very quickly", he said. "Importantly, it informed all the relevant authorities in both the US and the UK," Mr Bernanke said. However, when asked by one committee member whether he could reassure people in the US who had loans and mortgages linked to Libor that it was reliable, Mr Bernanke replied: "I cannot give them with any confidence as the BBA did not adopt [the recommendations]. " Democratic senator Robert Menendez said the Libor scandal represented the "culture of greed and lying" in the banking world. "This is a huge issue. [Libor] is more than a benchmark," Senator Menendez said, citing figures which indicated that in some areas of the US, the majority of sub-prime mortgages were linked to it. Mr Bernanke said it was "a major problem for our financial system and... we need to address it." It would require an international effort, he said. The system could go "from what is essentially a reported rate to an observable rate, market rate… but Libor is very deeply ingrained in many contracts so it won't be easy," he said. 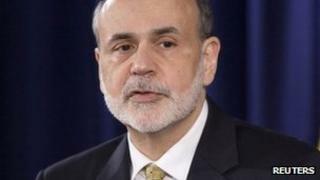 Mr Bernanke also called for action to address the massive tax rises and spending cuts looming in the US. If these were not changed, the US could fall into recession, he said. At the end of 2012 tax cuts brought in by the George W Bush administration are due to expire and $1.2 trillion (£770bn) in automatic spending cuts will take effect. Central bank chairman Ben Bernanke told US senators that the fiscal cliff, as it is known, needed to be tackled "sooner rather than later". "The most effective way that the Congress could help to support the economy right now would be to work to address the nation's fiscal challenges in a way that takes into account both the need for long-run sustainability and the fragility of the recovery," he told the committee in his opening statement . Mr Bernanke reiterated his concerns about the slow pace of the recovery and job creation and confirmed that the central bank's monetary policy-setting committee was "prepared to take further action as appropriate". He also talked about the risk to the US economy of the eurozone debt crisis.